In 2005, I discovered I have healing hands. My friend decided to quit dialysis and all medications without a doctor’s care. Within hours of stopping her medications, she became agitated, uncomfortable and unreasonable. I felt compelled to slowly move my hands about six inches above her body from head to foot. I repeated this until she calmed. My friend called the experience going to Nirvana, a higher state of consciousness where there is no suffering. At her request, I repeated the process once or twice daily until her death five days later. My experience with my friend was so powerful I began studying energy healing. In 2007, I opened my business To soothe and to heal, now doing business as ”Healing Energy Services,” and offered sessions to clients. The results were so astounding, I closed my Proposal Writing and Development business. In 2009, I completed Healing Touch for Animals Level 1, taught by the program founder Carol Komitor, and expanded my business to include treatment for animals and their people. Having experienced the power of Healing Touch, I wanted to explore every aspect of energy medicine. I earned my Reiki Master degree, studied Pranic Healing, Matrix Energetics®, Reconnective Healing®, The Reconnection®, ThetaHealing®, EFT (Emotional Freedom Technique), and Access Consciousness®. Each method offered additional avenues for accessing the healing stream that flows around and through us. I learned and practiced Transcendental Meditation. I continue to study and expand my knowledge of energy healing through classes, reading and experience. I am a decade volunteer with my Maltese/Lhasa Apso canine companion, Sophie, in Providence Hospital’s Animal Assisted Activities and Therapy program. I also volunteer for Providence’s No One Dies Alone program. I volunteer as an energy healer at Hawks Prairie Veterinary Hospital with Dr. Kim Martin and at Catherine Place in Tacoma. I regularly contribute to Energy Magazine and The Pet Connection Magazine and speak and teach on energy healing. I am active in Healing Touch Program meetings and on the certification board of Healing Touch for Animals. My book, Choosing Energy Therapy: A Practical Guide to Healing Options for People and Animals, was published in 2014. 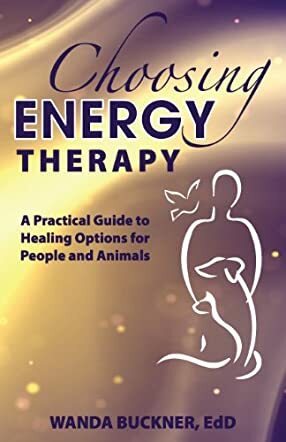 Choosing Energy Healing: A Practical Guide to Healing Options for People and Animals discusses a different, unique, and holistic approach to healing physical, mental, emotional, and spiritual problems for humans and animals alike. Energy medicine can be used as a complementary modality that works with the health care practitioners you already have such as your doctor, your chiropractor, and your mental health care specialists such as your therapist or counselor. Or it could be used as an alternative modality on its own. Every human being and animal has a bio-magnetic field or aura that can be worked on and, with energy medicine, can be healed by an energy worker. The concept of energy medicine may seem New Age or bizarre, but there is much evidence that energy work can improve and heal many people and animals faster and more thoroughly. Readers will learn all about energy medicine and can make an informed decision for themselves and their animals. Author Wanda Buckner writes with clarity and authority on the subject of energy medicine. She writes in a very easy manner that enables readers to grasp the complexity of energy medicine as it can be very abstract. Buckner gives many examples and scientific proof for the efficacy of her work and those like her. She gives all the alternatives to readers to educate them so that they can make their own decisions based on the material she presents. I like the fact that she is not pushy in any way and explains things in a very straight forward, open manner. I would highly recommend this book for everyone who wants to expand their horizons in treating/healing themselves through an alternative or complementary way in addition to Western medicine.